Sirollus Saccus is an Imperial smith working at Hawkmoth Legion Garrison in Ebonheart. He sells the best repair hammer in the game, "Sirollus Saccus' Hammer". Sirollus is also one of the only restocking suppliers of Glass Arrows. He has 3500 gold available to barter with, making him one of the richest merchants in the game. When asked about latest rumors he will say: "I've heard there's a shrine to Sheogorath hidden in Vivec. Some claim to have spoken to the Daedric Prince, but they must be madmen. At least, they are now." 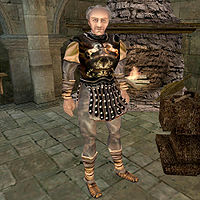 According to the book The Armorer's Challenge, Sirollus Saccus left the Imperial Province for Morrowind 300 years ago after losing an Imperial contract to a poor Argonian smith. He came to Morrowind to improve his trade, and evidently stayed there ever since. "Sirollus Saccus' Hammer" is one of the only tools of "Secret Master" level available anywhere in the game ("Secret Master" level tools exist in the Construction Set for all four alchemy apparatuses, as well as lockpicks and probes). Though he will initially only sell one at a time, his stock can be increased so that you can buy as many as you need in a single purchase. 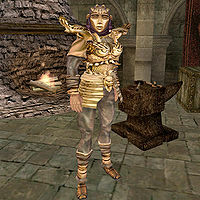 If you are using the LeFemm Armor official plugin, Sirollus will be wearing a complete set of Gold Armor—which looks somewhat odd on him, as the armor was designed to be worn only by female characters. This is one of only three sets of this armor available in the game. It's likely that the developers gave him the armor intending him to have it for sale, without taking into account the fact that he would automatically put it on instead. This will make getting it off of him without killing him somewhat difficult. You'll need to use Disintegrate Armor spells until it breaks, then cast Calm to stop him from attacking you, and then pickpocket it from him. Alternatively, you could sell him better armor, which he would put on in its place. Unfortunately, only very rare Ebony or even rarer Daedric Armor will be good enough to convince him to give up his Gold Armor willingly. He is supposed to be the master trainer in Armorer, as well as offering training in Blunt Weapon (76) and Block (71), but he does not actually offer any training due to an oversight. This bug is also fixed by the official LeFemm Armor plugin. This page was last modified on 19 October 2018, at 21:38.